Slowly please – dear guests to Simonskloof. Spring is upon us and with it the young and tiny, almost prehistoric creatures are wandering across the roads – hence looking sometimes just like another rock. 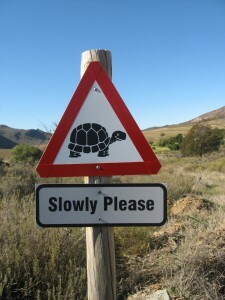 The larger ones of the Leopard Tortoises can be heard and sometimes spotted mating all over Simonskloof. Our oak trees are also out of hibernation providing much loved shade with a new layer of squeaky green leaves perfect to pitch your tent under. The temperature is hovering between 10 and 20 degrees making for ideal hiking weather, be it exploring our 5 short 1-3h trails or taking the 16.5km & 14.5km Gecko trails under your foot. 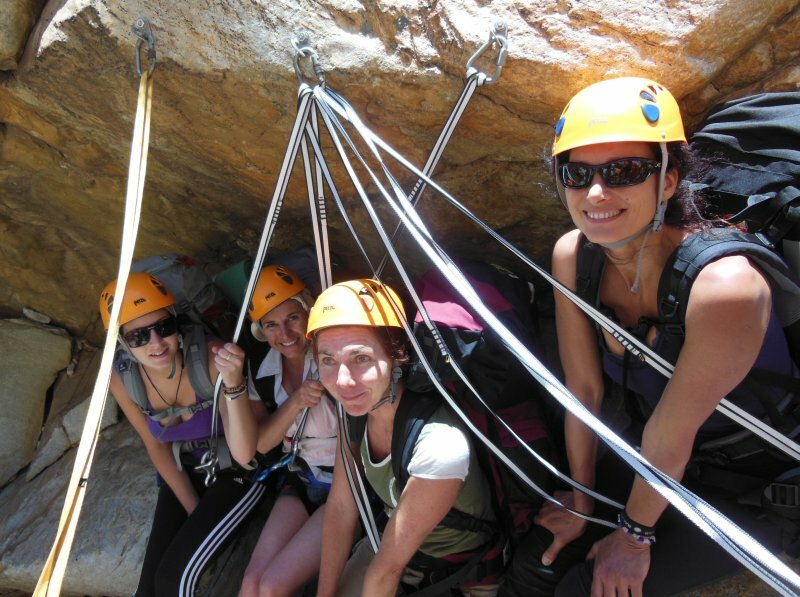 For an adventurous kloofing trip give it another month for the Nuy river to warm up some more, while the 60m abseil above the gorge is as ready as ever! And if the last couple of lines were too on high on the adrenaline scale – bring a book, a bottle of your favorite and lazy out in the hammock or take a soaking in the bush bath which come “standard” at all our cottages. Jurgen & Ninon, Mom and a menagerie of sheep dogs, chicken and real stories about REAL honey! 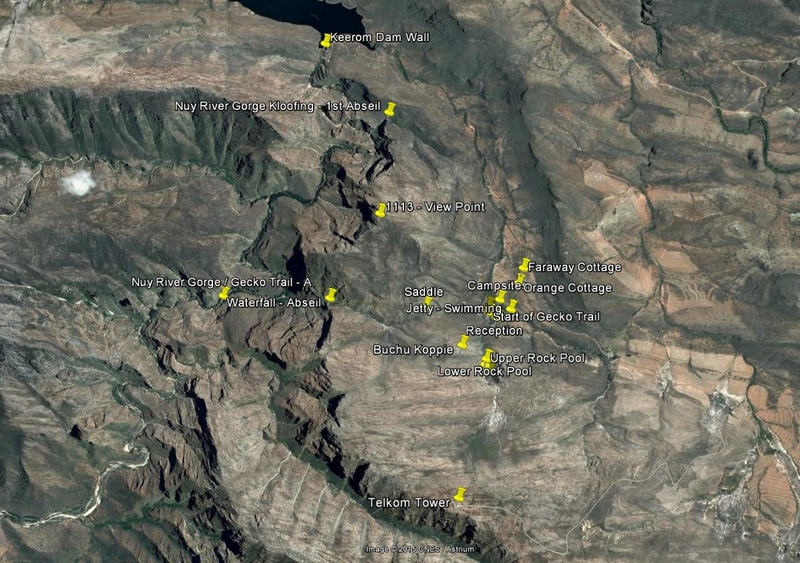 Ever wondered where is what at Simonskloof? How far is Faraway cottage from Orange or Eric’s Place? Are the cottages private and have un-interrupted views? Where does the Gecko Trail start? How far is it to the rock pool or to the Jetty of the Farm dam? 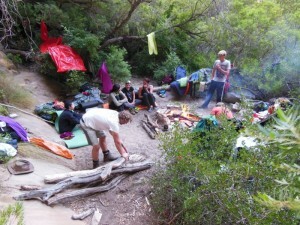 Where’s the campsite and where does one Abseil or go kloofing? 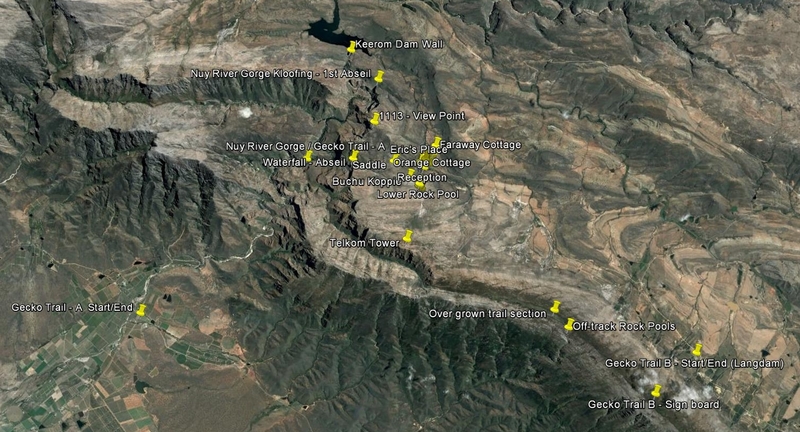 How far is it to Langdam or Nuy Vallei (the other ends/starts of the Gecko Trail)? 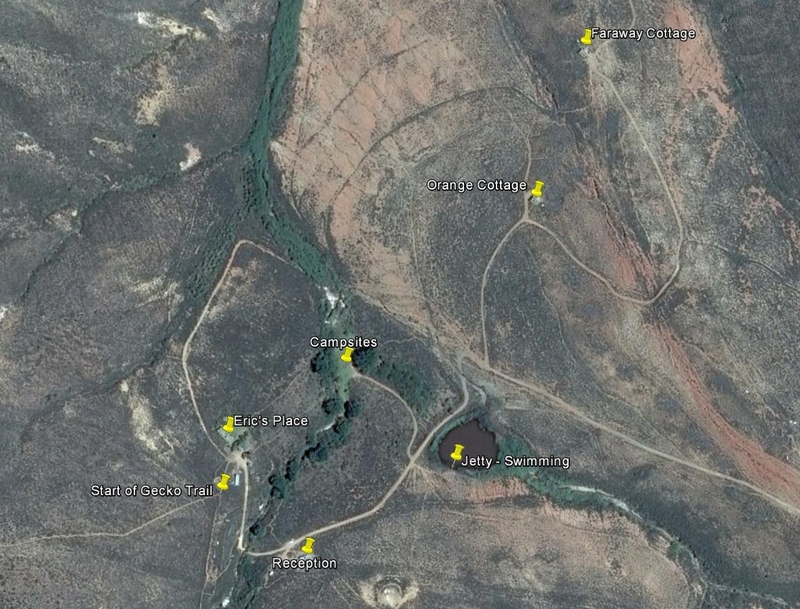 So here you go indulge in a couple of GOOGLE-EARTH images from close-up to a perfect overview (2’000 – 25’000m above the earth) to get a good look at Simonskloof Mountain Retreat. Hence looking at the differences of foot to car, it’s a “no-brainer”, that once you are at Simonskloof, you’ll keep the car keys in your pocket and WALK 🙂 ! Which brings me to the next announcement: Autumn/Winter/Spring is HIKING season!!! So, see you soon at Simonskloof – Boots and All! 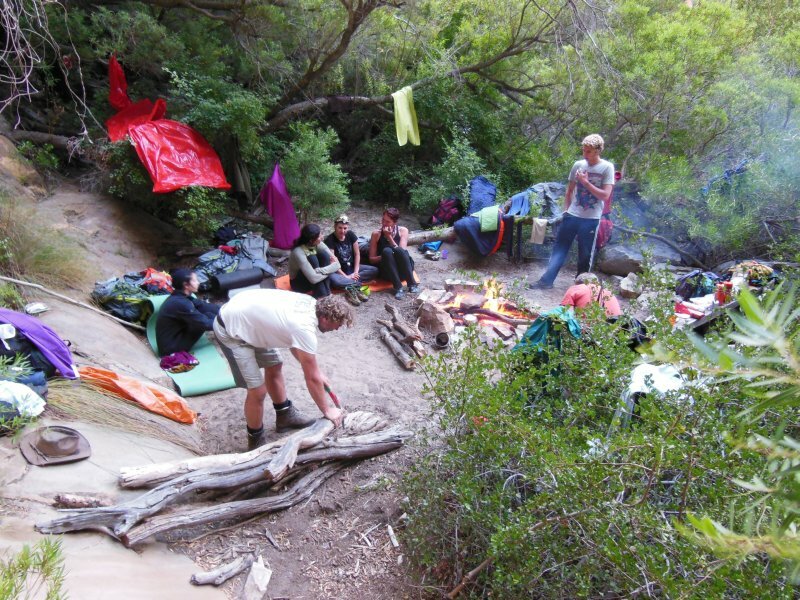 Last weekend we had our first Kloofing trip of the 2013 season in the Nuy River Gorge. What a blast and what a fantastic group: A French-Swiss-South African Family of note! As my back-up/helping guide, there was our WWOOFer from the “Dutch Mountains”. Also for the first time we offered a self-catered option, were the participants cooked for themselves. But had they not been “vegetarians”, they probably would have wrestled us for our T-bones steaks on a red hot rock and the bottle of Tangled Tree Shiraz (a most delicious local wine in a convenient PET bottle) – hey, gotta do it in style! The freshly brewed coffee we did share though. The weather played ball too, with a slightly over cast sky in the morning but sunny descent while abseiling. The river water was the chilliest for a December trip I’ve ever experienced, yet was perfect to cool off from the afternoon heat. And yes backpacks do float – no need for Otter-Trail style “French Polonies” NO pun intended – all you need is a backpack rain cover and it floats! Our next trip is just around the corner, this Saturday it’s an “All in One Day” on a slightly shorter loop and with a perfect weather forecast: A slight drizzle at the end of the day, but we’ll beat that with an ice cold Windhoek draft! SO, if you are feeling adventurous, get a group of 4-6 friends together and call us with a date and type of trip you prefer! Your life was meant to be an Adventure – Grab it! For more pictures please visit our Facebook page!